Felicity Defined: A Live Game of Clue! A Live Game of Clue! The board game Clue was one of my favorites as a child. The mystery, the challenge, good 'ole Colonel Mustard taking people out with a rope in the study. 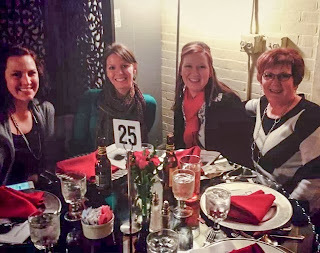 When I came across a Groupon for a Murder Mystery Dinner at the Signature at the Indianapolis Propylaeum I had to see what it was all about! I couldn't think of better people to accompany me on this quest to solve a crime than my mom and 2 sisters. 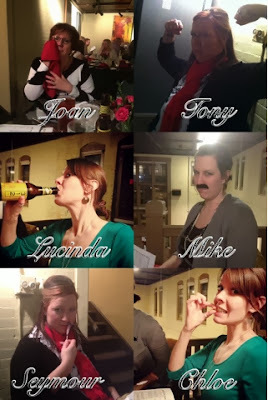 So, we picked an event date from the long list of themed murder mystery dinners such as "Who killed cupid?" and "And the award goes to ... murder!". We chose the "Who killed cupid?" where Valentine Cupid "gets knocked off"! 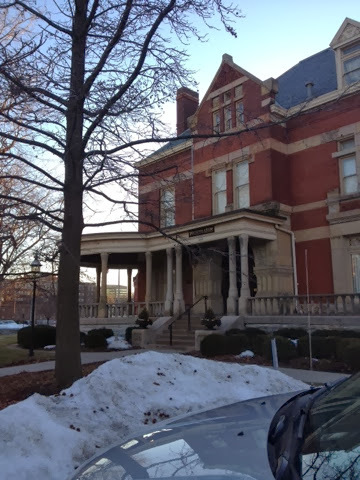 Before the event guests have the opportunity to tour the Propylaeum which is a house built in 1888 in the Old Northside historic district of Indianapolis. It is a club for Indianapolis-area women, with a mission "to emphasize a sense of civic responsibility and community services; to foster the love of literature, music, science and the fine arts; to provide women a social and cultural center." The Indianapolis Propylaeum offers events and holds weddings and such. We toured the three-story house with period furnishings then headed to the carriage house where we were sat for dinner. There were 180 people at the event, split between the main house and carriage house of the Propylaeum. There were tables set for 6 and each place setting had a character booklet. The character at your place setting was your persona for the evening. There was background on the character, dialogue and questions to ask and info on how to answers questions asked to you - no props or costumes. The murder mystery began with the detective (a person that worked there) setting the scene. Valentine Cupid had been murdered in the chicken limo!!!! The staff then instructed us that each table of 6 were to complete the dialogue and ask each other questions as directed to try to solve the murder mystery, all while staying in character! We did not get up and mingle with the other tables because each table was acting out the same scenario. Unfortunately 2 of our 6 people did not show up to the event so one of my sisters and I played two parts (which got a little confusing). We ate the 5-course dinner while completing this dialogue - garlic tomato soup, strawberry salad, plum tomato and cheese fettuccine, chicken cordon blue and chocolate grenache - served throughout the evening. Beer and wine were available at the bar. Joan was an actress and Valentine's bride-to-be, Tony, the Italian hunk, was hired to ferry Joan to her wedding venue, Lucinda was Joan's drunk aunt, Mike was Valentine's best man who backed out of the wedding party last minute, Seymour was a film director and Chloe was a young actress. We completed the dialogue, asked the questions, ate the yummy food and had a great time acting, laughing and being funny! The detective would make announcements from time to time and the waitresses brought around clues and evidence. Evidence included poison gummy bears, an emerald ring, gold coins and candy ... It was loud, a little wild and full of life in this carriage house turned murder scene! 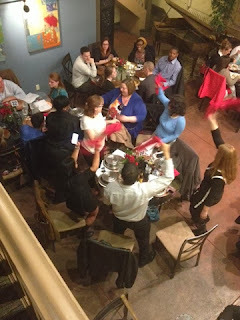 Each Lucinda was even asked to serve their table their entree while dancing like a pole dancer ... say what? Ultimately each table had to agree on a suspect and turn in their guess as to who murdered Mr. Valentine Cupid. The detective then uncovered the mystery of each character and announced who murdered Cupid! There was only 1 table in the carriage house that guessed correctly ... And it wasn't our table ... We should have brushed up on a little Law & Order before we attended! Even though my table did not solve the crime, the event was a blast - just a fun, out of the ordinary Friday night - the food, the wait staff, the guests, the house all enhanced an already exciting activity. I would suggest checking out these events for a girls night out or even a date night. There were groups of woman and lots of couples. If you attend, I suggest letting loose and allowing yourself to "become" your character ... where else will you be able to go all CSI with your closet friends?